The company store is running a holiday sale on selected items. Members can take an extra 15% off the member price by entering the code HD2018 in the “Promo Code” field in your cart before checkout. The sale will run between November 24th and December 31st. Items: GN Apron, Rusty Dusty Book, Hogs Head Reminisces Book, DVD of the Twin Cities, Naperville and Klamath Falls conventions, Stations Across Marias Pass CD, HO Portable Depot, HO Section Foreman’s House and HO Sand House, all culverts and retaining walls and the remaining GNP Billboards. Ken Silvestri: Ken Silvestri here, Broadway Limited Imports. 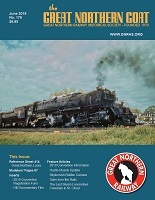 BLI is producing a GN S2 hybrid locomotive and I’m hoping you can help me make your members aware. The web page of the S2 is here: http://broadway-limited.com/gns-2.aspx . My telephone number is 386-671-7444. Don McGlothlin: Ken, if you provide us with the information we will gladly get it out to our members.